State is the front-end data that gets rendered by your single page web app. This course introduces you to Redux, then shows you how to take an existing Angular 2 app and adapt it to use Redux for application state management. Have you ever run into issues where your Angular 2 application gets into a broken state and you end up spending hours to track down the issue? 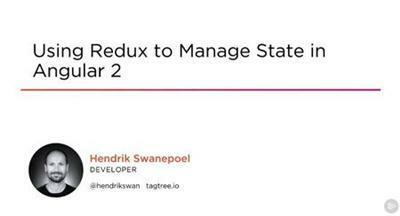 If so, Using Redux to Manage State in Angular 2 is the perfect course for you. You'll be able to develop Angular 2 apps while ensuring that the state that your views bind to is predictable and easy to troubleshoot. First, you'll learn the core principles of Redux without using Angular. Next, you'll see how to move the state management of an existing Angular app over to Redux, using a library called ng2-redux and rxjs. Finally, you'll see how you can safeguard your application state against unwanted changes and how easily you can test your state logic when you use Redux. When you're finished with this course, you'll not only be able to use Redux to manage the state of your Angular 2 application, but also be able to use the concepts introduced to tackle any single page web app project with confidence.